Compact and streamlined, the Oakton meter features 0.1 mV resolution, a hold button to freeze reading, easy switching between measurement modes, ATC, recorder output, electrode diagnostics, and three-point pH calibration with automatic buffer recognition. It also allows you to store and recall 50 readings in the memory and comes with a convenient pull-out reference card to keep the procedures handy at all times. The simple push-button keypad and the large, dual-display LCD makes it a snap to use. An AC adapter and “All-in-One” probe are included. 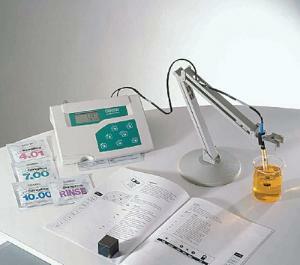 An electrode holder is available separately. Range: pH 0.00–14.00; ±400 mV and 1999 mV; 0–100°C. 110 VAC. Size: 9"L x 7"W x 2 3/8"H.